As Yoda might have said, "Come soon, the new Star Wars movie will." The latest film in the franschise, "The Last Jedi," will hit cinemas in December, and it's never too early to start preparing for your (cinematic) journey to that galaxy far, far away — or, of course, to create your own hive of scum and villainy. Though current technology may not yet allow us to reach distant planets by hyperdrive, there are nonetheless scores of Star Wars–themed gadgets on this very planet, from robot Stormtroopers and child-sized replicas of Luke Skywalker's landspeeder to droid-building kits for intrepid Jedis-in-training. These are our favorites from the Star Wars universe, for fans of all ages. After all, whether you use the light or dark side of the Force, handy a lightsaber is. Lightsabers are probably impossible in plain old reality — but they can exist in augmented reality. 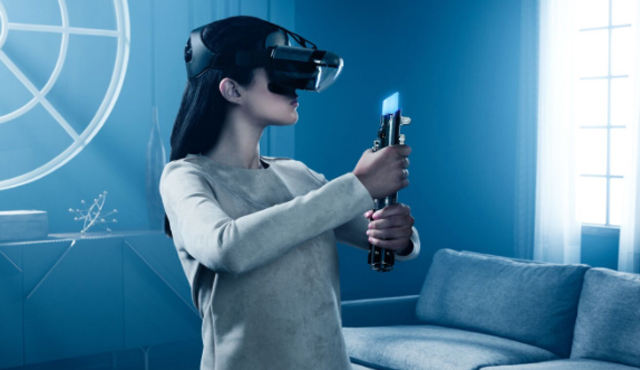 Prep for an epic space battle with Star Wars: Jedi Challenges, a smartphone game that works with an AR headset and a controller with lightsaber powers — when viewed through the headset, at least. Players can make like Luke and hone their lightsaber skills in training battles with followers of the dark side of the Force, including Kylo Ren and Darth Vader. Haptic feedback means the controller buzzes when a lightsaber beam is parried by another beam — or when it strikes its dastardly opponent. The AR headset, made by Lenovo, has two fisheye sensors for positional tracking and a separate tracking beacon in a base to allow natural movement in any direction within the augmented universe. There are also holographic chess games played with virtual (and slightly grisly) alien pieces, and the chance to organize a coup d'etat by marshalling rebel forces against evil Empire and expanding Resistance outposts in a massive, sim-like ground battle. For knights-in-training, a new character called the Archivist will be on hand for instruction on gameplay. Price: $199.99 from Lenovo. Preorders open now; available in November. Banish do-gooder rebel forces from your territory with this 11-inch Stormtrooper humanoid robot from the AI and robotic company UBTECH. The First Order soldier-bot comes with voice recognition, facial recognition and a sentry mode that allows it to patrol a small designated area. An infrared sensor helps it avoid any obstacles while detecting and halting intruders. If your family members or roomies are sworn to the Sith, you can save up to three photos of their faces to its biometric database, allowing them to come and go with ease. 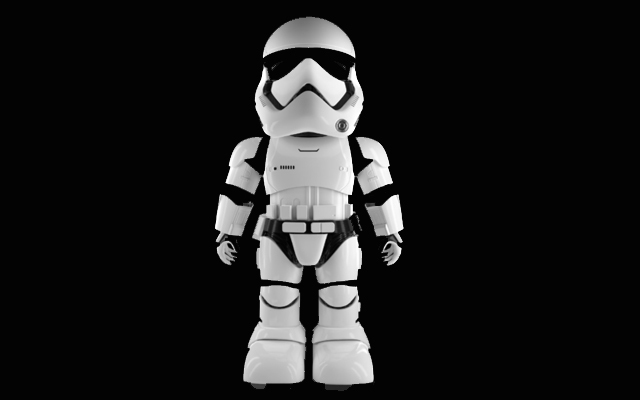 Along with taking voice commands, the Stormtrooper also works with an augmented reality app (iOS and Android) so you can direct it to "attack" intruders from your smartphone in a third-person Commander view, or experience Stormtrooper life firsthand with the first-person Trooper view. The Stormtrooper communicates with its app over a closed and encrypted Wi-Fi network — which means it can't be accessed by another online device, like a comlink operated by that pesky Luke. Who gets a Sith Lord to clean their floors? 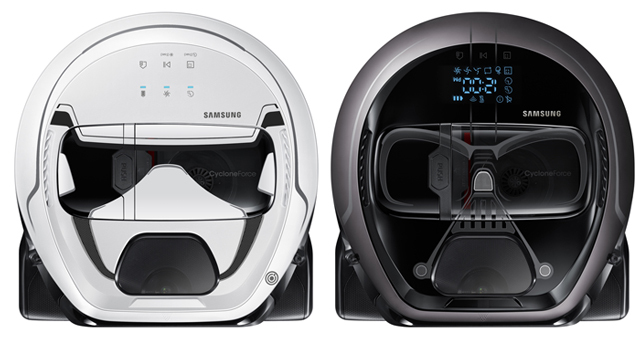 You, that's who — if you have the POWERbot vacuum cleaner from Samsung, which comes in Darth Vader as well as Stormtrooper limited editions. The vacuum has nine sensors to map the shape of each room and avoid furniture as well as items as small as 10 mm. The Darth Vader version comes complete with the Dark Lord's infamous wheeze that sounds on startup. It also boasts the same 10-watt suction power of the original POWERbot and an "edge clean master" design. Wi-Fi connectivity allows you to remotely control its movements via smartphone if Vader hasn't gotten to those corners. The Stormtrooper vacuum, which sports the recognizable white and black helmet design, calls out, "Let's go!" when it starts cleaning, but lacks Wi-Fi connectivity. Samsung collected information from superfans to cast a vote in the design, production, marketing and distribution of the product, possibly making it the only crowdsourced vacuum cleaner available. Price: $699 (Stormtrooper model) and $799 (Darth Vader model with Wi-Fi) from Samsung. Preorders open now; shipping from November 5. 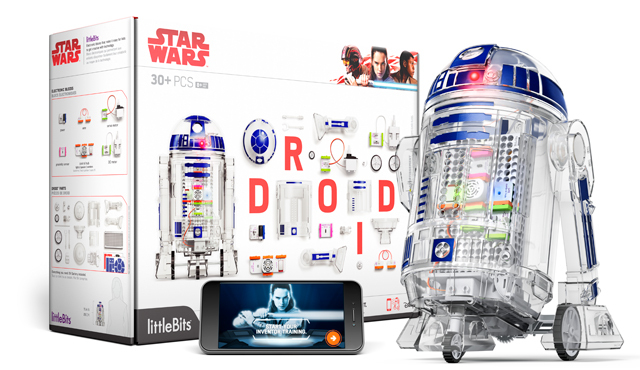 The next generation of intergalactic inventors can get started now with this kit to design and build a droid sidekick. 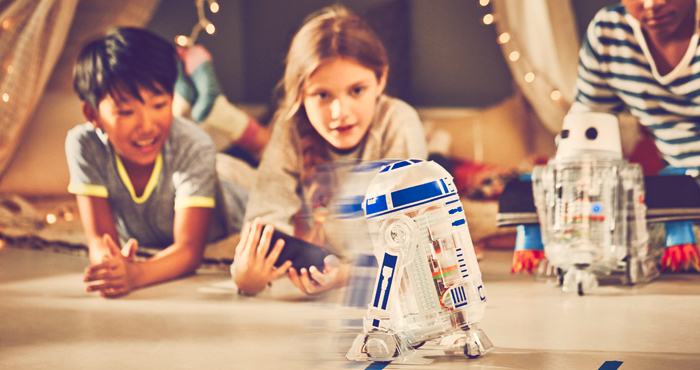 Kids grades 3 to 8 can combine 20 droid parts and 6 electronic blocks to build a controllable, moving droid, with sticker sheets to customize their new robot friends and buttons for the droids to make sounds from the Star Wars films. A companion app for iOS and Android includes video tutorials to take kids through inventor training, as well as in-app controls for drive mode, force mode and self-navigation for the droid. Once up and running, the droids have over 16 missions to complete, helping kids get to grips with the abilities of their droids, and inspiring ideas for how to reconfigure the droid parts for even more functionality. Many of the missions also call for kids to create new artifacts out of household items — such as an obstacle course to train their droid in navigation, or even a new head (made out of a handy milk carton maybe?) — to totally reimagine what a droid is all about. 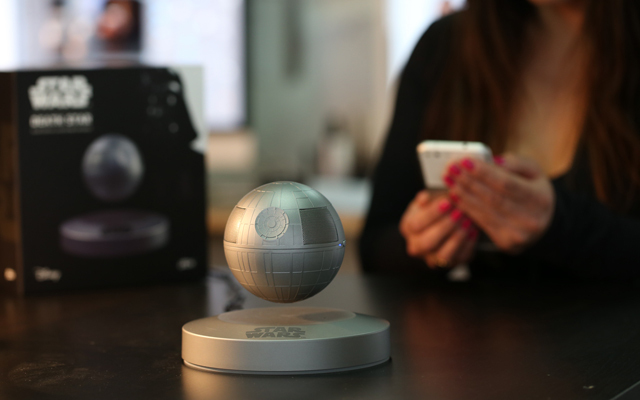 Display your dedication to the Empire with this antigravity Bluetooth speaker designed by Star Wars fans to resemble the moon-sized space station of Dark Forces, the Death Star. The orb levitates using magnetic technology, rotating above a base emblazoned with "Star Wars," pumping out music in 360-degree surround sound with its five-watt speaker. The Death Star speaker can rock with your favorite tunes for up to five hours of continuous playback before its Force must be recharged, and has a range of up to 10 meters (almost 33 feet) from your smartphone or computer. Got a mission across the galaxy? Its 1 kg (2.2 pounds) mass makes it easily totable. Everyone can use a loyal robotic companion, whether they're storming the Death Star or cleaning up their room. At 16 inches high (19 with antenna) this replica of the lovable, spherical BB-8 is near life-size (well, film-size) and can roll after you wherever you go. Its ball of a body is topped by a dome head that contains all the sensors and smarts for navigating its surrounds, recognizing voice commands and expressing a range of emotions, including curiosity at what it sees and delight if you ask it about friends like Luke or Rey. You'll also be able to command it to go away — though prepare yourself for the disappointment with which it will roll off. A dual-joystick remote lets you control this adorable bot's movements, though it'll also simply roll after whoever is holding the remote. It can flash lights and emit sounds just like its film counterpart, with similar paint markings, down to the wear and tear. Like any droid, BB-8 needs occasional juicing up: It comes with two rechargeable batteries (one for each of its two body parts), and requires three AAA batteries, which aren't included. 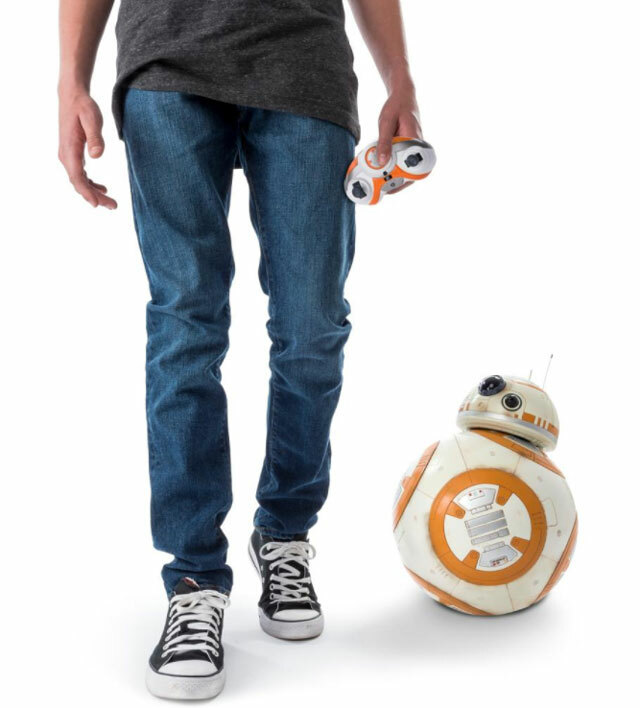 BB-8 is best for kids (and adults) over six years old. Always losing your keys to the landspeeder? 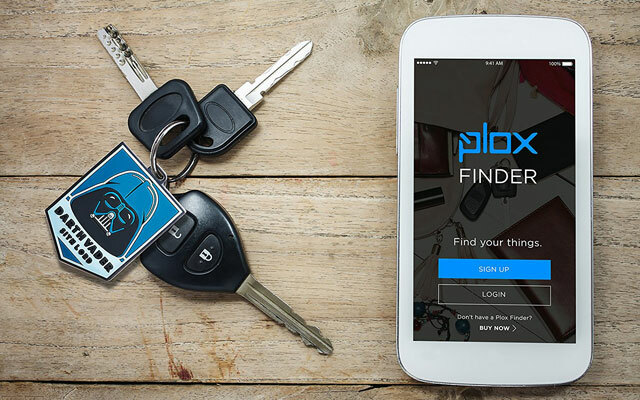 Attach a Bluetooth-enabled finder with the face of BB-8, Chewbacca or R2-D2 and you'll be able to track down any lost object via a companion smartphone app for Android and iOS. More of a Dark Side fan? The finders also come in Darth Vader and new evil droid BB-9E designs. The smartphone app shows the last-seen location of your finders, and each finder can emit its character's iconic sound when you move more than 100 feet away from your phone. If, on the other hand, it's your phone that's been lost, the finders can also act as a remote control that signals your phone to play a Star Wars-themed sound. Until anti-gravity craft are invented here on earth, we'll have to stick with wheeled landspeeders — like this kid-sized cruiser from Radio Flyer, modeled on the sun-faded X-34 landspeeder Luke Skywalker piloted across Tatooine on many a desert run in "Star Wars: A New Hope." 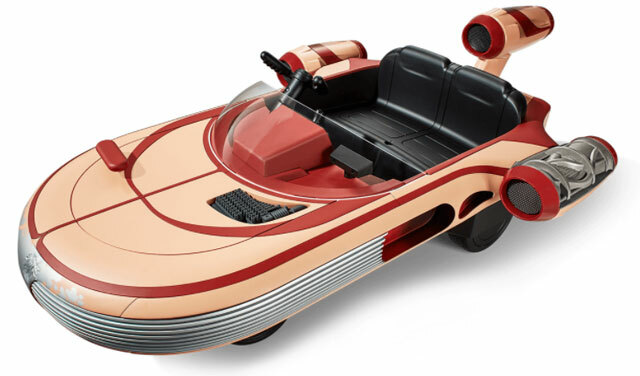 Like that storied jalopy, Radio Flyer's landspeeder features three turbine engines and replica repulsor vents, with a peeling paint job like its sand-blasted cinematic equivalent. It fits two pint-sized riders — one with control of the steering wheel, the other riding shotgun — and the gear shift can take the ride from 2 mph to 5 mph, plus backwards at 2 mph. The dashboard sports flashing lights and five sound effect buttons for Luke-esque phrases, R2-D2 bleeps and C-3PO's voice, as well as the whirr of flight and engine startup and shutdown sounds. The landspeeder is recommended for kids 4 years old and over, and can hold a maximum weight of 130 pounds. When it runs low on juice, it can be recharged via its 12V battery. For the true Star Wars fan to prove their mettle: This tiny, all-knowing cube of Jedi knowledge will guess your thoughts — as long as you're thinking of a Star Wars location, human, creature or some snazzy space technology from the first six Star Wars movies or the Clone Wars. 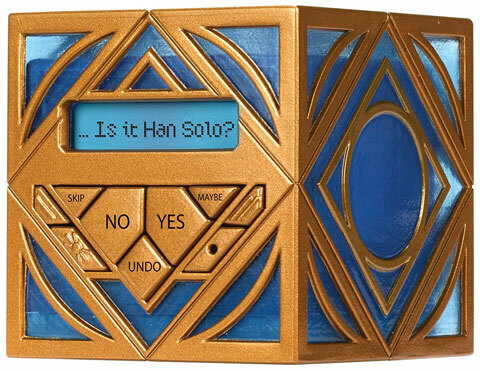 The Holocron will guess within a maximum of (a copious) 20 questions. If it doesn't succeed, the glory of knowing you bested Jedi wisdom is yours.